STATE COLLEGE, Pa., Oct. 10, 2018 /PRNewswire/ -- AccuWeather Global Weather Center – Michael will make landfall over the Florida Panhandle during early Wednesday afternoon, perhaps as the strongest hurricane on record to hit the region. Landfall is just a few hours away. "Catastrophic Hurricane Michael continues to intensify as it approaches the Florida Panhandle. It is the strongest storm to hit the U.S., in terms of wind, since Hurricane Charley in 2004. It's crucial to note that a 150-mph storm has four times the force of a 110-mph storm. Damage will be catastrophic within a 50-mile stretch of the coastline where the eye makes landfall, centered around Apalachicola Bay. It will look like a bomb or tsunami hit the area. We now believe that the coastline will cause the water to converge as high as 18-20 feet in isolated areas. This is moving water, which is extremely powerful. We've all seen pictures of what a tsunami can do. If people are still there and can still hear us, they need to do everything they can to survive," AccuWeather Founder and President Dr. Joel N. Myers said. "Michael is a historic storm. A Category 4 hurricane has never struck that part of Florida. The coastline will be changed for decades," AccuWeather Vice President of Forecasting and Graphics Operations Marshall Moss said. "Impacts from Hurricane Michael along the Florida Panhandle will include a dangerous Gulf of Mexico storm surge, flooding rainfall and damaging winds," according to AccuWeather Hurricane Expert Dan Kottlowski. Download the free AccuWeather app for the latest track forecast and information on Michael's predicted impacts. "AccuWeather predicts that Hurricane Michael's total damage and economic impact in the U.S. will be close to $30 billion," Myers said. "The greatest impacts will be near and east of where the hurricane's eye makes landfall, and particularly along the coastline because of angry seas in a dangerous ocean storm surge being driven inland by onshore winds." "In comparison, AccuWeather's final damage and economic impact prediction of $60 billion for Florence was largely due to the storm's inland flooding and damage. Due to Michael's fast movement, inland flooding is not expected to be nearly as severe as it was with Florence. However, the greatest risk of flooding will occur in northern Florida and southern Georgia, where AccuWeather is predicting a Local StormMax™ of 12 inches," Myers said. 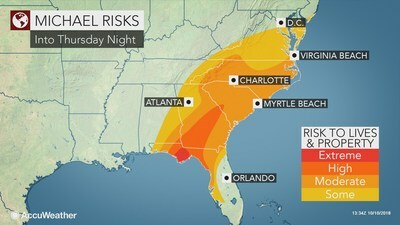 "Michael will also bring the risk of flash flooding across the Carolinas, especially across eatern areas hit hard by Florence. As Michael is expected to track within 100 miles of the Carolina coastline, gales of 50-60 mph will result in additional damage. Our forecast for Michael's ultimate economic impact factors in damage to expensive coastal resorts, costs of evacuations, lost wages, disruptions and damages to businesses, power outages, mold concerns and other health hazards in the six-month tail period following the storm as well as delays in Florence cleanup," Myers added. A significant amount of water will be funneled into Apalachee Bay and the stretch of coast between Mexico Beach and Keaton Beach, Florida. Interests in this area should be prepared for Gulf of Mexico storm surge flooding averaging between 10 and 15 feet. "We expect less rain to fall with Michael, when compared to Florence," Kottlowski said. Some areas that experienced flooding from Florence are likely to face renewed flooding but perhaps on a lesser scale due to Michael's forecast increasing speed. However, some rivers may rise more swiftly than before due to the wet ground. "AccuWeather has provided forecasts and impactful warnings of severe weather with documented Superior Accuracy™ for 56 years. We have developed a unique expertise for damage and economic impact predictions by analyzing the total effects of the storm from before it hits to the immediate and post impact effects, including the six-month tail period afterward. That's why AccuWeather has been by far the most accurate source of damage and economic losses of any source, regularly beating out financial and insurance companies and other weather sources. AccuWeather accurately predicted damage in advance of storms during the 2017 hurricane season and ahead of Florence," Myers said. More than 1.5 billion people worldwide rely on AccuWeather to help them plan their lives, protect their businesses, and get more from their day. AccuWeather provides hourly and Minute by Minute™ forecasts with Superior Accuracy™ with customized content and engaging video presentations available on smartphones, tablets, free wired and mobile Internet sites, connected TVs, and Internet appliances, as well as via radio, television, and newspapers. Established in 1962 by Founder, President and Chairman Dr. Joel N. Myers -- considered the "father of modern commercial meteorology," the nation's most respected source on the business of meteorology having been named "the most accurate man in weather" by The New York Times, and one of the top entrepreneurs in American history in Entrepreneur Magazine's Encyclopedia of Entrepreneurs -- AccuWeather also delivers a wide range of highly customized enterprise solutions to media, business, government, and institutions, as well as news, weather content, and video for more than 180,000 third-party websites.